Experience firm, moist skin with this rich, super-hydrating moisturizer that delivers nutrients and antioxidants to encourage a healthy, vibrant skin. Shea Butter, Bio-active Antioxidants, Seaweed Extract and Sunflowers Oil help reduce dryness and repair cellular damage. Excellent for all skin types, this moisturizer also contains 24 Karat Gold, Collagen and Hyaluronic Acid to help deter free radicals and combat signs of aging, leaving skin a radiant, youthful glow. 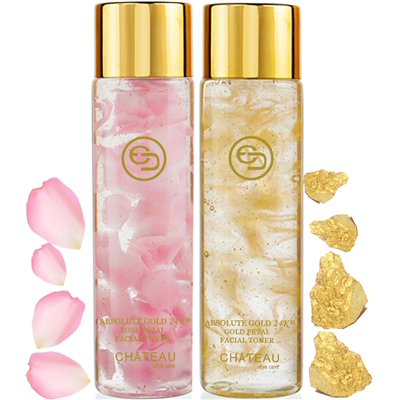 Apply all over the face and neck after cleansing and after using Absolute Gold 24K Lifting Facial Serum. DISTILLED WATER, PEARL EXTRACT, GLYCERINE, STEARYL ALCOHOL, SUNFLOWER OIL, SEAWEED EXTRACT , GLYCERYL MONOSTEARATE, PROPYLENE GLYCOL, STEARIC ACID, WHEAL GERM OIL, SHEA BUTTER, LUBRAJEL, CETEARETH-2, CETEARETH-21, COLLAGEN, CARBOMER 940, TRIETHANOLAMINE, METHYL P-HYDROXYBENZONATE, HYALURONIC ACID, 24K GOLD. This product keeps my face moisturize all day. I scoop one white ball with spoon which is all you need for face and neck. The cream absorbs quickly with no sticky residue on fingers. Now I have the entire 24k Absolute line except the facial wash. Also, I am using clay and mud masks, 24k gold exfoliating peel and clairasonic facial brush which will help the Chateau products work very well.